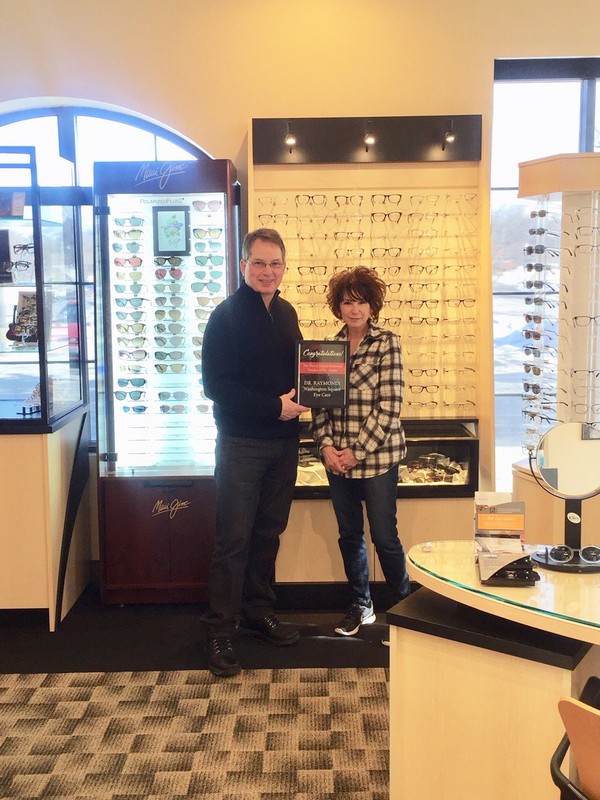 Preferred Vendor of the Month, Washington Square Eye Care! This February we are “setting our sights” on a fantastic local business we have used for years…Washington Square Eye Care! Dr. James Raymondi has had his business in the strip of Washington Square for 15 years and still has the same staff of knowledgable and friendly faces they started with in 2003. They are a full service optometric office offering personalized eye care. In addition to routine eye exams they provide contact lenses for kids to adults, including speciality lenses for those who are wearing bifocals or have astigmatism. They also do examinations for diabetics and co-manage the various types of refractive surgery such as LASIK. Emergency visits for conjunctivitis (pink eye), foreign body removal and other acute issues are handled by Dr. Raymondi. Their dispensary has a broad and fashionable selection of frames for men, women and kids and a premier line of sunglasses in Maui Jim (which Dr. Raymondi considers one of the best available). Dr. Raymondi is a native to Canton and received his Doctor of Optometry and Bachelor of Science in Physiological Optics degrees from The Ohio State University. He is married to Samantha and they have two children, Nate and Kelsey, who are both attending graduate school. He enjoys golfing, fishing, shooting, bike riding and walking his dogs on the Stark Parks trails. Washington Square Eye Care was voted the best in Stark County Readers Choice Awards in 2013 and was runner up in 2014 for favorite Optometrist/Opthamologist office. Most vision and medical plans are accepted including VSP, EyeMed, Aultcare, SummaCare, Medical Mutual, Aetna, Medicare and others. They are located in the strip at Washington Square, on the corner between Best Burger and 91 Wood Fired Oven. Office hours are Monday through Friday, 10am to 6pm and Saturday 9am to 1pm. Visit them on Facebook or on their website at www.wseyecare.com!